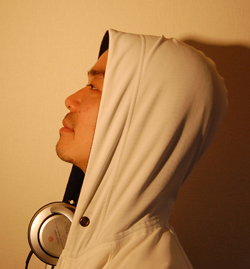 LOUD ONE began his dj career in 1998 in Osaka after returning from US/Canada where he was inspired by club scene there. In 2001 he was picked up as a support dj for Jeff Mills Japan tour and his raw yet prominent talent was exposed to a wider audience. This resulted in gaining a resident dj slot at club LUNErS (now WAREHOUSE702) and more gigs. In 2003 LOUD ONE moved to Tokyo and launched his own night ‘rec’ at MANIAC LOVE, the leading underground techno club back then. Then he participated in the massive outdoor ‘Nagisa Music Festival’, ‘Solar Frequency’and also played alongside djs such as Funk D’Void, Heiko Laux, Abe Duque, Carl Craig to name a few. He now hosts and spins at ‘CrossGate,’ an alternative techno party taking the scene to next generation, and he enjoys massive support from Japanese crowd as well as overseas artists. In 2010 he had 2 digital releases, ‘Drive’, ‘Intersection’ which reflect his dj skills and career caltivated last 10 years. LOUD ONE has been spreading reputation as “dance floor conductor” and he is one of the best leading djs in Japanese techno scene today and the one to watch out for.